Tristan's father taught him everything he near about tracking and canyoneering, but after his father disappears during a hike, Tristan doesn't often get a chance to roam outside. His mother won't get out of bed, his father's outdoor outfitting business is foundering, and his uncle can barely help his family buy food. When he meets Brigit and her young brother Dean, he is interested in going canyoneering with her. Brigit, just a few years older than Tristan, is raising Dean after the death of their mother, and working for Alex, who had a rival adventuring business. When Tristan is able to go on an adventure with Brigit and a Polish climber, Dominik, he realizes how much he misses the outdoors. When his mother's caretaker, Elspeth, suggest that his mother would handle the death of his father better if she has some artifact from his last hike, Tristan decides to go to the dangerous lower canyon to look for one. He does this with Alex's blessing, and Brigit goes along with him. It is soon apparent, however, that Brigit blames Tristan's father for her mother's disappearance and intends to make Tristan pay. Will Tristan find an clues of his father in the forest... or will he ever be able to get out alive? Withers' has a knack for describing extreme sports, and her titles such as First Descent, Peak Survival and Vertical Limits all give lots of details about a variety of adventure pursuits. Not only is there a lot of technical discussion of ropes, packs, boots and bolted belay stations, but there are vivid scenes of flash floods, rappelling down rock faces, and hiding in mud pools. While I could have done without the mother's protracted grief, it was interesting to see Tristan try to be the adult in the house. He helps out with the business, cooks and cleans, and still tries to do well in school and go through his own grieving process. He is a motivated and realistic characters who faces adversity with grit and determination. I'd love to see more teen characters with those qualities. Tristan has every reason in the world to give up and let others care for him, but instead he powers through and ultimately saves the day. 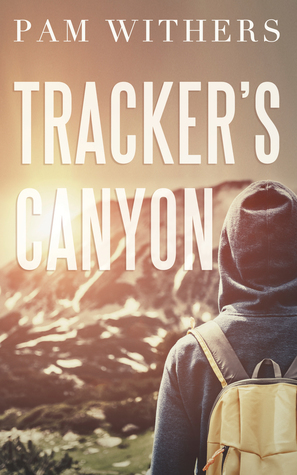 With the emotional depth of Alden Carter's Walkaway and the Lawrence's The Skeleton Tree, Tracker's Canyon is a great addition to the back pack of any reader who craves details about how to jump into freezing water or make coffee over an open fire.